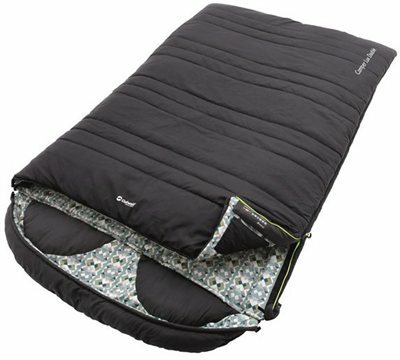 Snuggle up together with the Outwell Camper Lux Double sleeping bag. With extra filling to keep you toasty from late spring to early autumn, this is a great choice for couples who love to camp. The super soft, breathable material and in-built pillows offer cosy comfort, while the zip-on hoods keep chills at bay on cooler nights. Contrast lining means it looks great too! This has not been used for camping yet. However, it has been the perfect solution as a spare double bed when used in conjunction with a double sleeping mat. The comfort is at least equal to sleeping in a "proper" double bed and the practicality afforded by good design and construction makes it the ideal sleeping bag for us. We are looking forward to using this in the "wild" next year. After some comparative research I chose this double sleeping bag. A great choice! It is a top quality product that feels like a duvet and provides for a warm and comfortable nights sleep. We used it in our tent on top of an air bed. Whilst not yet used during cooler months it promises to provide this warmth throughout Spring and Autumn too and may even make an appearance during Winter, though possibly on top of insulated roll mats too !